This dictionary includes the fundamental terminology of each of these areas, the major discoveries and significant scientists that comprise the history and current development of the field, as well as a number of concepts. The vocabulary is presented within the broader lexicon of developmental biology and embryology, which provides context for these three fields. 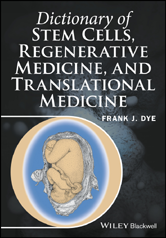 Topics covered range from stem cells (embryonic, adult, and iPSCs) to teratology. The inclusion of extensive cross-referencing of the terms will enable readers to broaden their understanding of them.